On these web pages you will be able to find out about Meccano, Hornby Dublo Trains, Maldon and Great Waltham, Essex, where we lived for over 30 years from 1971 until 2003. We live in Maldon, Essex an ancient market town on the river Chelmer and Blackwater. Maldon is one of oldest recorded towns in England with a history stretching back to Roman times. The town is most famous for the Battle of Maldon of 991 when the local Saxons lead by Byrthnoth (an Essex nobleman) were heroically defeated by attacking Vikings. Today the town is known for the Thames sailing barges moored at the Hythe Quay, the historic High Street, Market Hill, Maldon sea salt, the annual Regatta and the mud race once held around Christmas time but now in the spring, when the mud and river water are not quite so cold! Until 2012 I worked from home as a Graphic Design Consultant but I decided to retire to enjoy life more. I am married to Anne, we have two grown up sons Daniel and Dominic. My hobbies and interests are: Meccano model building, Hornby Dublo trains, history, gardening, designing and maintaining these web pages, walking, travel, sketching, photography, swimming and making bread. I like to listen to Blues, rock and Jazz. Click on the graphics or links on the left to find out more. 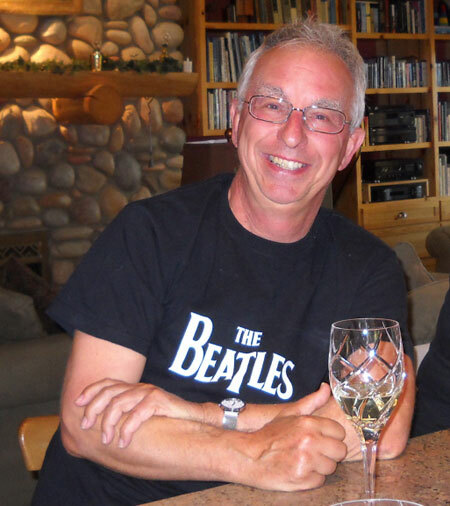 Yes that's me in the picture, enjoying a glass of wine, at my good friend Stan's house in Idaho U.S.A.